Surfing does you good when you are more concentrated and oriented on what you want to learn. Than little beautiful knowledge pop-ups pop in front of your screen. I came across some beautiful calligraphy that grabbed my attention immediately. They were not masterpieces but still there was a small naïve touch in them that warmed me inside. Especially the miniature that you see above had always left s trace in my artistic evaluation. I finally got to know who the man behind this miniature is. Also I got to know that he left behind an album, his masterpiece, that is kept at the Yıldız Palace Library. This album of 120 pages was presented to Sultan Mehmed IV in 1665 and in 1828 found its way into the Collection of the well-known poet of the period Ziya Pasha, to whom it was probably presented directly from Sultan Mahmut II. When or how it was placed in the Yıldız Palace library is unknown. The poems in the book were warren by Gazneli Mahmud himself and show him a by no means a distinguished poet. He was also a calligrapher and inscribed hid poems on paper of his own manufacture. As a calligrapher he is above average and sometimes attains quite a high standard of excellence but the ornamentation and the miniatures although inventive at his time are of no more than average workmanship. In other words in any one field he is undistinguished. What is remarkable is that the whole book, including the paper, the calligraphy, the illumination and the poem themselves are all his own work purely. The book also offers some information about Mahmud’s life. He was a Turk and lived in Istanbul in the 17th century. A poem about Sarajevo shows that at some time he had resided in Bosnia, while his interest in music is shown by some lines listening to various different modes. The picture above illustrated shows how successful Gazneli Mahmud was as a miniature artist. 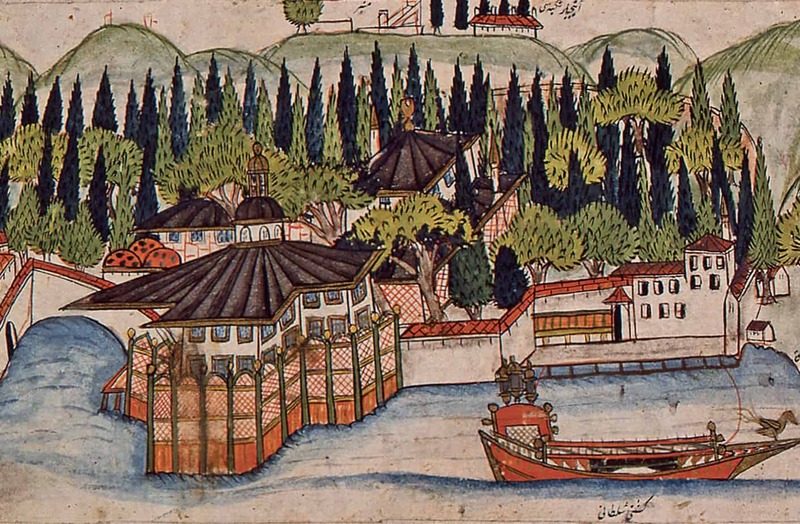 This miniature is located at the Aynalıkavak Pavillion in Istanbul. Gazneli here employs perspective in a Western Manner and I fell in love with this. He was at the same time a painter of flowers in the classical Turkish style, with vases of flowers surrounded by fruits such as pears, cherries, figs and grapes. One can take the bold step in saying that he was the first Turkish painter of nature morte. By the way he should not be confused with Gazneli Mahmud who was the first ever Turkish ruler entitled as Sultan and he was also the first one to introduce Islam to India.